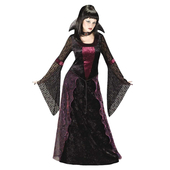 This red hot vampire costume is perfect for any Halloween fancy dress. 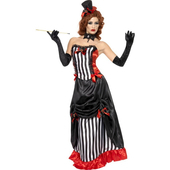 It includes a striped corset style top with clear straps and red trim with bow detailing. It also includes a striped skirt with gathered detail. To complete this red hot look there is a headband with attached mini tophat. Stockings, choker and gloves may be purchased separately. True to size came within 2 days. Fit was good, delivery came fast. Would recommend getting liquid latex and the vampire make up accessories. There's some great videos on youtube. 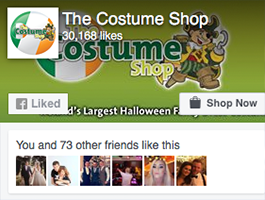 Can't wait for halloween. Highly recommended, very good quality.